This house is furnished from top to bottom with top of the line furniture and appliances. Westinghouse LCD HDTV/DVD's in every bedroom. This house is big and roomy, perfect from family reunions or corporate retreats. It is also especially suited for weddings. Everything is provided just bring groceries. White sugar sand beach & turquiose water is at your back door. The beach is only a few steps away: as you open the curtains, the sounds, smell and breath taking views of the ocean take over your senses. This home is so close to the water you can watch your children playing on the beach and the dolphins cruising in the ocean without leaving the deck!! Vacation should be stress free, so you will have to disengage and relax. This 3500 square foot GULF FRONT house offers plenty of room for large groups. You will love cooking and having meals with your family and friends; we provide a dinning room table that seats 14 people.The rest will sit at the oversized Granite bar.Everyone can enjoy meals together in the delightful,10 foot ceiling,huge living and dining room area. The kitchen is fully accessorized with upscale furnishings and stocked with all the extras to spoil you! Including a wet bar. However, to make cooking easier you will also find at First Class an outdoor grill. Sleep has never been this sound. The 2 master suites custom window treatment tries to block the beauty out for some rest, but it seldom keeps you inside, in fact, all window treatments are custom-made. There are six bedrooms in total (ceiling fans in everyroom of the house): one suite on the first level, and 2nd suite plus four more bedrooms on the second level. The bunk bed bedroom is perfect to camp out the kids(8)while the adults enjoy piece and quiet . You will find HD TV/DVD players in all bedrooms, plus a HUGE a 60' Sony HDTV in the living room. We also have brand new top of the line bedroom furniture, washer and dryer for your enjoyment and marvel. The memories of laughter, the sounds of joy and unique moments spent together with family and friends will be forever part of your unforgettable stay at First Class! Treat yourself to this incomparable Gulf Front home. You won’t regret it. For a finishing touch, outside shower, charcoal grill, 3 picnic tables and alot of beach. 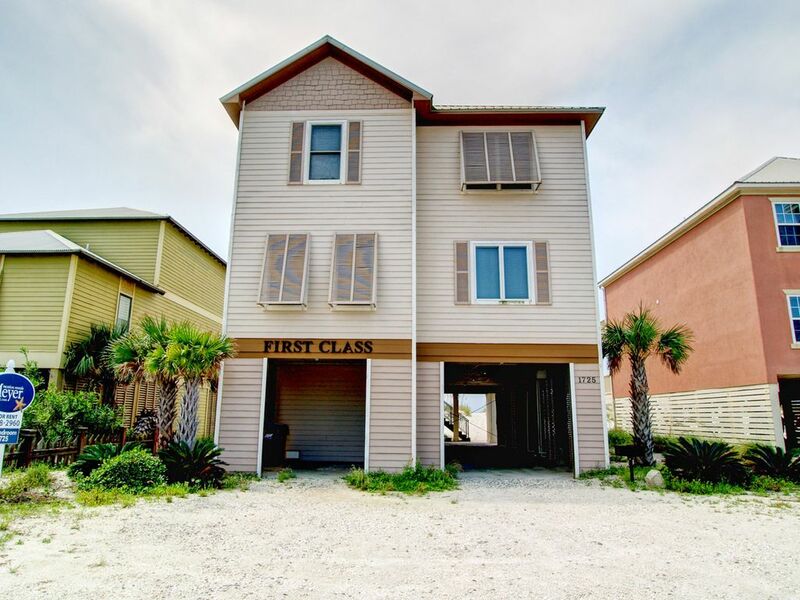 First Class is 2 miles west of Hwy 59 so you feel away from it all, but are only minutes from Gulf Shores array of restaurants, shops and attractions. Nearby Lagoon Pass is wonderful for fishing, hermit crab hunting and more. Enjoy the water park, go carts, putt-putt and more, all just a few miles away. Within a half hour you can see historic Ft Morgan or the National Naval Air Museum and Blue Angels flight team. Large outlet mall 8 miles north in Foley. Parasailing and jet ski rentals are 2.5 miles east. There are a number of world class (Trent Jones) golf courses and marinas in the Gulf Shores area and even dolphin watching cruises. Step out you door into the white beach sand. Bath towels only, tenant must provide own beach towels. Besides a few minor problems that happens with rentals, our month long stay, made it very hard to leave at the end. Our family is definately coming back next year. My second time and wont be my last. Came this time with girlfriends for a photo getaway to take photographs of the area. This house was a dream for us. What a perfect place. Plenty of room for us with a bath in every bedroom and an extra one off the living room. Each bedroom was spacious and furnished with a great bed one bedroom equipped with double bunks. Only 1 mile from the main Gulf Shores area to Shop but it did not matter we had our beach area to take wonderful sunrise and sunset pictures. And of course our group picture on the beach. The Family room and kitchen was equipped with everything to cook all the meals and have game nights on the rainy day like we did have. No-one was walking all over each other with all the room this house has. We will definitely be back "First Class" you have our heart. Thank you Sam for letting us use your home for the week you are a pleasure to work with. Our family had a great reunion, but more attention needs to be given to maintenance. House was clean & the long dining table is impressive, but some of the furniture is worn & needs replacing. The garbage disposal & kitchen sink are held up by a car tire jack, and the dishwasher did not work twice. The beach location is great! The house was what we needed for our group and we had a wonderful weekend. Also caught lots of fish. The only negative comments are the carpets are dirty in the bedrooms, the table on the back porch has slate tiles and is difficult to use, and the lights in the downstairs ground floor are motion activated, and it goes off in about 30 seconds. Needs to be on switch or at least stay on a lot longer before turning back off. We had a great time and really enjoyed out weekend. Thank you for the house. Very nice and well maintained house! Naval Avation Museum; Battleship Alabama; World Class Deep Sea fishing, Trent Jone, Arnold Palmer golfing.